A quadrilateral is a four- sided polygon with four angles. The interior add upto 360 degrees. 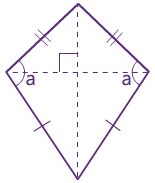 A quadrilateral with four 90-degree angles. Also opposite sides are parallel and of equal length. A quadrilateral with opposite sides parallel. Also opposite angles are equal. A quadrilateral with four equal sides and four 90 degree angles. Also opposite sides are parallel. A parallelogram with four equal sides. Also opposite sides are parallel and opposite angles are equal. A quadrilateral that has exactly two sides parallel. It has two pairs of sides. Each pair is made up of adjacent sides that are equal in length. 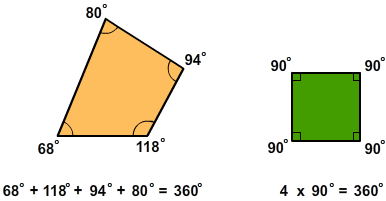 The angles are equal where the pairs meet. Rectangle: A quadrilateral with four 90-degree angles. Also opposite sides are parallel and of equal length. Parallelogram: A quadrilateral with opposite sides parallel. also opposite angles are equal. Square: A quadrilateral with four equal sides and four 90 degree angles. Also opposite sides are parallel. Rhombus: A parallelogram with four equal sides. Also opposite sides are parallel and opposite angles are equal. Trapezoid: A quadrilateral that has exactly two sides parallel. Kite: It has two pairs of sides. Each pair is made up of adjacent sides that are equal in length. The angles are equal where the pairs meet.